Imagined what gave maximum return in 2012? Well you must be thinking of Gold or Real estate. No hold your breath it is SILVER. Silver has given 25.61% returns on CAGR in 2012! It is almost unbelievable silver price was Rs. 51,043 / Kg on 1st January 2012, and it is now Rs. 64,116 /Kg on 20th Sepetember,2012 which is 25.61 % return in just 9 months. You must be existed but wait let me tell you another part of it. If we check out exact one year return than return in silver is just 0 %. Yes before exact 1 year in September 2011 silver were costing same Rs. 64,353 /Kg. 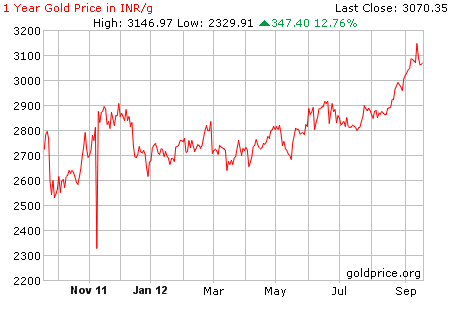 If we checkout GOLD, gold has given 16.63 % returns on CAGR in 2012 which is second highest. 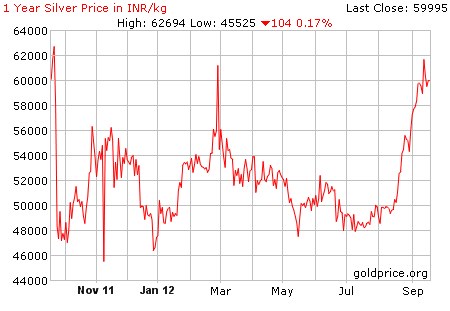 Gold price as Rs. 27,322 / gm on 1st January 2012, and it is now Rs.31, 865 /gm on 20th September, 2012 which is 16.63 % return in just 9 months. To invest in Gold or Silver is always debatable topic. Let’s explore you should invest in gold or silver. In India Gold is something which every family buys we have some type of attraction with this yellow shining metal. On any occasion on any festival wearing gold jewelry is always first choice. White shining metal silver is liked by only few people or by people who cannot afford Gold. We don’t think of Silver or Platinum for investment. Gold is only option we think of when it came to buying some precious metals. This is the reason gold always remain in news. History shows gold has always given consistent good returns in last decade. But you will be surprise to notice that silver has outperformed gold most of time in last decade and provided fabulous returns. For example, you must be aware that in year 2009 Gold has given 19.3% return but you might not know that Silver has given 42.4% return in 2009. 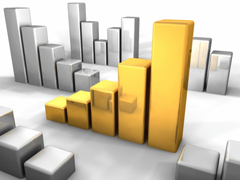 In year 2010 Gold has given 22.3% return while Silver has given huge 70.6% return. Below is graph which shows you Gold and Silver price performance % annual change in last decade. You must be confused now. To invest in gold or silver? Many times you have seen that silver has outperformed gold but if you look carefully gold has always given consistent positive returns. Silver is for risk-takers. It has higher highs, and lower lows. The future of silver is entirely speculative. Silver price is volatile in nature and which are very difficult to predict while Gold price are bit easy to predict. Gold is a much more stable investment. Gold’s value is generally on the rise, and its occasional dips tend to be limited. Gold is an excellent hedge against inflation and it is good Investment option. So I still prefer Gold compare to silver as investment option. Please share your comments on Gold and Silver as an investment option. Yellow metal gold is really amazing but i was not knowing that silver has also perform well. In past 10 year Silver has given more return compare to gold this is really amazing.